Working in the design industry, I just can’t help it: sometimes I pick out wine based on its label. I know, it seems shallow and ignorant, but it’s true: A good wine package makes me want to pick it up, read about the wine, learn the winery’s story, and then take it to the cash register. My husband is the more pragmatic one in our drinking relationship: He rarely buys wine because of the label. He compares prices, reads pairing notes, and comes home with some of the ugliest wine bottles out there - and usually the wines are great and compliment his meals perfectly. 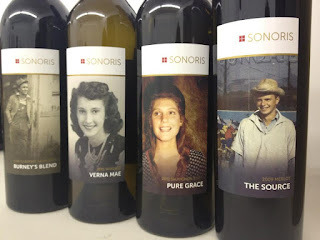 But then there was Karen Sjolund - Pure Grace on the label of Sonoris Wines’ 2011 Columbia Valley Sauvignon Blanc - and she changed everything. There she is, off center, looking to her right, caught in an open smile that looks like she was about to say something. She’s young - late teens - and has big brown eyes and auburn waves that fall on her shoulders. She’s wearing a blue dress covered in little white hearts and she’s standing in front of what appears to be a bear skin rug. “She is a little blossom,” said my husband, and he insisted we take the wine home with us from Sonoris Wines release party. (We also took home some Sonoris 2009 Merlot, The Source, which features a youthful picture of her future husband Alan, so she wouldn’t be lonely). that wine can be all of those things at once. Sjolund’s family roots are deep in California, where her paternal grandfather, Burney, opened his first grocery store in 1945. As he built his business over the next few decades his only child, Hillary’s father Alan, joined the business with his wife. In the 1980s and 1990’s Sjolund’s expanded three times. On September 8, 2012, at Russell’s in Bothell, Hillary Sjolund released four splendid wines, each featuring a personally meaningful photo of her ancestors: The 2008 Cabernet Sauvignon called Burney’s Blend, named for her paternal grandfather; 2009 Merlot called The Source, honoring her father Alan; 2011 Sauvignon Blanc called Pure Grace, the meaning of her mother Karen’s name; and the 2011 Viognier named Verna Mae, honoring her maternal grandmother. While it was Sjolund’s paternal grandmother Dorothy who helped build the family business with her husband Burney, she passed away when Hillary was 14. When the time came to name her wines, Sjolund chose her living grandmother as a namesake. Sjolund said that growing up watching her grandparents, and then her parents, grow their business while staying close to one another and holding true to their ideals provides her with a wealth of inspiration and hope from which to draw. After training in the cellars at Pine Ridge Vineyards in Napa, then at DiStefano in Woodinville, Sjolund was ready to strike out on her own, and when she did she drew once more from that deep well of family encouragement and support. “Most kids want to separate from their parents,” when they get older, she said, but not so for the Sjolund siblings. Sjolund said that her parents had her and her two brothers when they were fairly young, so they still have a lot of youthful energy and participate in her and her siblings’ lives more than some of her peers’ parents do. This involvement meant, of course, that when Sjolund wanted to switch majors from premed to enology at UC Davis, her parents had their concerns. So Hillary took her parents took a tour at Pine Ridge Vineyards and for the first time her parents learned about the science behind wine. After taking the ‘romance’ out of winemaking, the Sjolunds could see it for what it was: art, science, and a business. And that they could relate to. Today Sjolund produces her wines at Charlie Hoppes’ Wine Boss facility in Richland, where several small production wineries work in a sort of custom crush facility. Sjolund leases space there both for her winemaking and for her independent quality control lab, where she puts her studious scientific strengths to good use. She’s always enjoyed the science behind wine, and is constantly reading and researching about the reasons things happen to wine - yeast, fermentation, oak, weather, etc. When it came time to name and bottle her wines, Sjolund said she let each of her parents and grandparents select the photo that would grace their wines from a handful of her favorites. Burney’s photo features him as a hardworking young man in overalls, just before he’d struck out on his own with his grocery business. Verna Mae’s elegant black and white photo is her senior portrait. Alan Sjolund’s photo was taken in front of his family’s store in 1965 - he laughed when he saw the photo and he still remembers when it was snapped. Hillary particularly likes that photo of her dad because of its similarities to the photo of her grandfather. Karen Sjolund - Pure Grace - is standing with that adorable smile in front of the hide of a moose she shot herself while hunting with her father in the Northwest Territory of Canada. That’s right, folks: her mom went moose hunting as a teenager. It’s only fitting that her brave, headstrong daughter should be blazing trails in Northwest winemaking. Hillary Sjolund will be pouring four Sonoris Wines at the Northwest Hope and Healing event at the Columbia City Gallery on November 1, 2012. Visit the Northwest Hope and Healing website to learn more about the event and the cause.